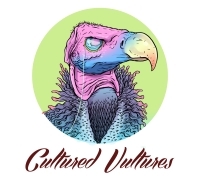 The rabble who keep Cultured Vultures going with their wonderful words. To find any of the pieces by this lovely lot, just click on their name. From novels to reviews to online dating debates, they are an eclectic bunch of talented peoples. Some of these guys write regularly, some when they can, some only once or twice. But they’ve all been a part of this wild ride, so they belong here. Would you like to have your photo here? Then simply e-mail: [email protected] or check out our about us page for more information.